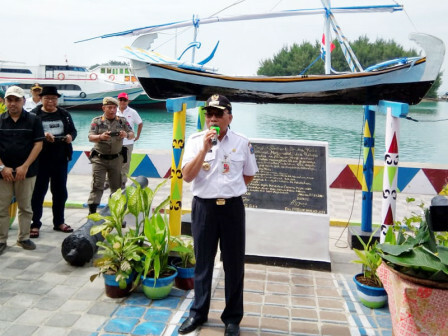 Thousand Islands Regent, Husein Murad inaugurates new selfie spot with Khole boat as its background which is located not far from Kelapa Island Urban Village office and Kelapa Island Port, North Thousand Islands.
" I hope this selfie spot can attract tourists and promote local wisdom and history of Thousand Island"
Based on local history, he explained, Khole boat is small traditional sailboat that uses oars and depends on wind to sail. This boat is made by local resident named Muhayar in 1950. In that era, Khole boat is used by locals as sea transport to go to other islands, including to Jakarta or Muara Angke Fish Market. It could take four to five hours to get to Muara Angke Fish Market when the northwest or north wind blows. "Khole boat has historical value for the locals. I hope this selfie spot can attract tourists and promote local wisdom and history of Thousand Island," he conveyed.